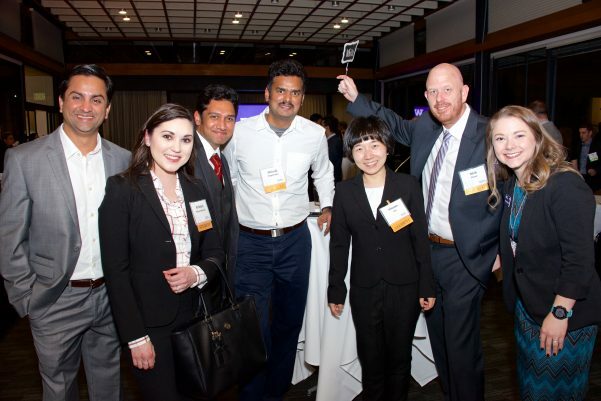 Welcome TMMBA Class of 2019! The TMMBA Welcome Reception is the official kick-off of the TMMBA experience. On the evening of November 2, the entire cohort of new students gathered together for the first time on the Seattle campus to meet each other, their future professors and the rest of the TMMBA team. Students were encouraged to bring their significant others to this event and they too were celebrated and welcomed into the TMMBA family. TMMBA Executive Director (and TMMBA alumna), Tracy Gojdics, formally greeted everyone and congratulated them on taking the first step in their MBA journey. TMMBA faculty veteran Jerry Cormick, PhD, who has taught Negotiations since the program’s inception in 2001, welcomed the group on behalf of the Foster School faculty. And finally current student, Michelle Hlaing, took the podium to share her experience, impart her wisdom and advice, and encourage everyone to fully enjoy the TMMBA adventure! Likely the thrill of the night, however, was the much anticipated reveal of study teams. It is at the Welcome Reception that students meet the 4-5 other individuals with whom they will work for the first half of the program. Study teams are a foundational component of the TMMBA curriculum. They are comprised of working professionals who represent various industries, functions, and experiences – all to provide students with a well rounded and diverse learning experience. Study teams complete group projects, collaborate on deliverables and presentations, prep case discussions, and provide support for one another during challenging times. Welcome TMMBA Class of 2019! !